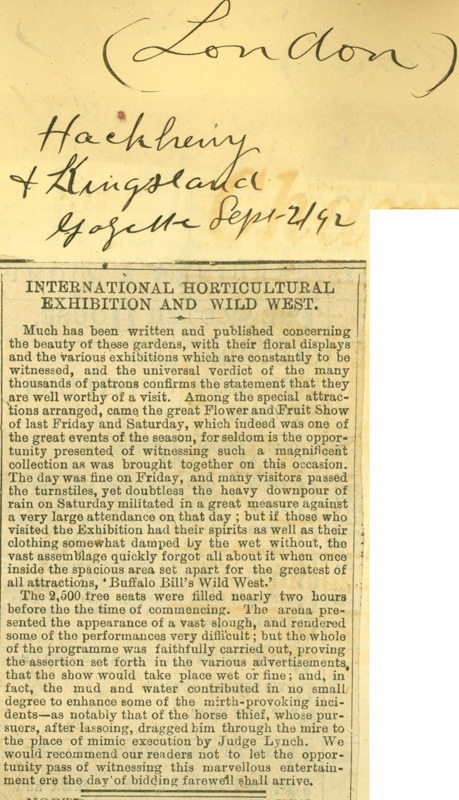 INTERNATIONAL HORTICULTURAL EXHIBITION AND WILD WEST. The 2,500 free seats were filled nearly two hours before the the time of commencing. The arena presented the appearance of a vast slough, and rendered some of the performances very difficult; but the whole of the programme was faithfully carried out, proving the assertion set forth in the various advertisements that the show would take place wet or fine; and, in fact, the mud and water contributed in no small degree to enhance some of the mirth-provoking incidents—as notable that of the horse thief, whose pursuers, after lassoing, dragged him through the mire to the place of mimic execution by Judge Lynch. We would recommend our readers not to let the opportunity pass of witnessing this marvellous entertainment ere the day of bidding farewell shall arrive.